Quick Breakdown: A highly addictive rhythmic brawler, with simplistic gameplay that's loads of fun. 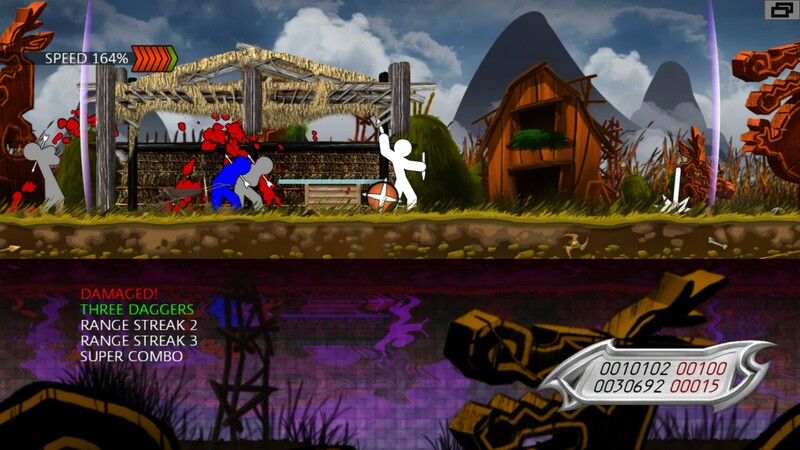 One Finger Death Punch (from here on OFDP) is a pretty simple and straightforward game. It's a 2D brawler that uses only two mouse buttons (or keys depending on your preference), and all its characters are simple stick figures. 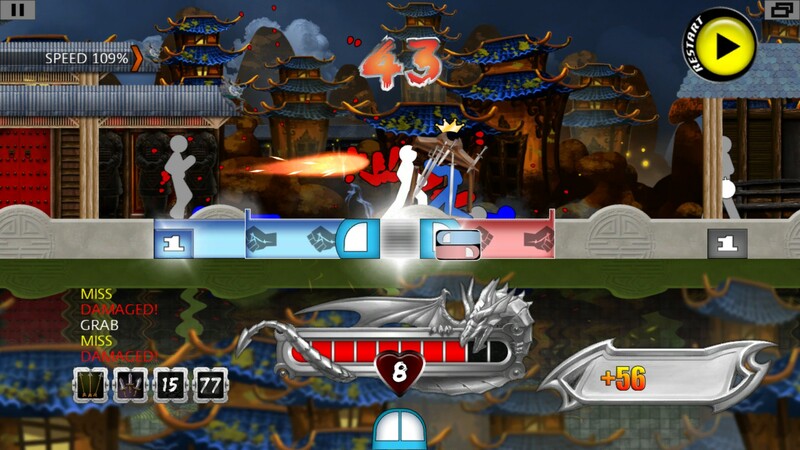 Enemies come at you from both sides of the screen, while you remain in the middle. You can't move about -- you instead must wait for enemies to come close enough to be in range. Once they are, you either tap left or right according to which side they are on to attack. Those are the basics of the game. Before we delve further into the gameplay, let's quickly go over the controls. The game instructs you to use only the left and right mouse buttons, and as the name implies, you're supposed to do so using only one finger. However, I found I preferred using two fingers, with one on each button. Furthermore, I didn't actually use the mouse to play more than a few levels to test it. While the game makes no mention of it, you can also use the left and right arrow keys, or the A and D keys (of WASD fame) to play. The game, however, does not allow you to remap the controls at all, for which there isn't a good reason. Thankfully though, using two fingers and the arrow keys worked wonderfully for me and I wouldn't have remapped even if I could. 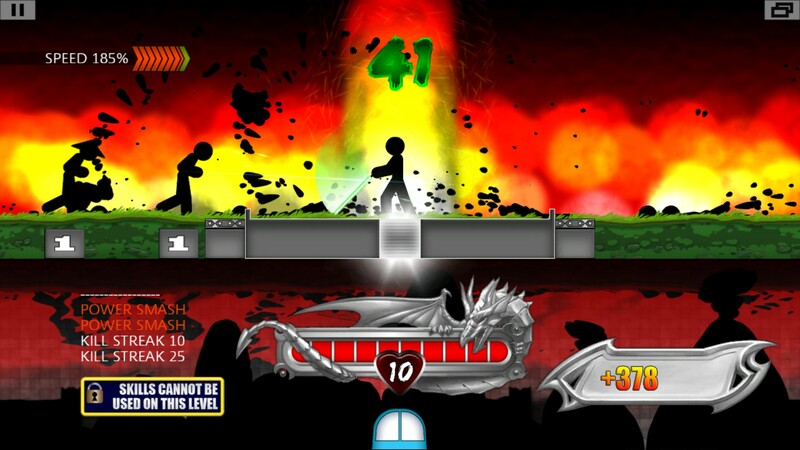 The gameplay features two modes: level and survival. Level mode will introduce you to the basics of the game, i.e. waiting for enemies to come into range, timing your attacks instead of button mashing (button mashing will not aid you in this game), and to the various enemies and their behaviors, and the different types of levels. So let's go over each of those things a bit more in-depth. I already talked about waiting for enemies to move into range, and how to attack, so we'll not go over that again. Now as for the button mashing, you'll want to avoid that. Missing makes you more likely to be hit by an enemy, as your character has a brief pause after missing before being able to attack again. This is bad because you have a limited amount of health for each level (usually 10 HP, but it varies by the level; sometimes you're left with only a single HP). 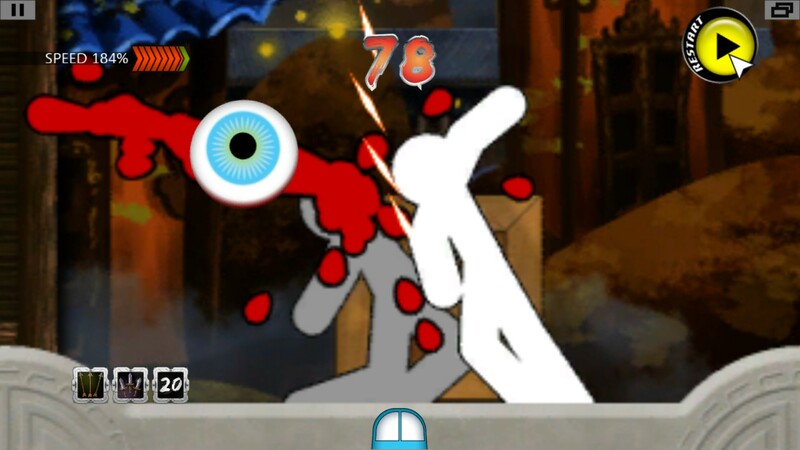 If you manage to complete a level without being hit, you will receive a perfect. You will also receive a medal depending on how many times you missed. 0 earns you a platinum, 1-3 a gold, 4-6 a silver, 7-9 a bronze, and 10+ won't net you a medal at all. Achieving perfects and medals will not earn you anything in the game, but chances are you'll keep replaying many levels until you get a perfect and a platinum medal. When you first start the game, enemies will consist of simple one-hit enemies and brawlers. Brawlers are a special type of enemy that brings you into a fight against just that one enemy, consisting of various left and right strikes (the rest of the level is tuned out until you defeat the brawler). As the game progresses, brawlers will have longer sequences of left and right, and more enemy types will appear. Now, there isn't great variety in the enemy types -- mostly, it consists of the enemies requiring more hits to be defeated, and the order for the button presses needed to defeat them (some enemies dodge to the other side of your character after being hit). All the enemies are colour-coded, so you can simply glance at them to determine the number of hits and order of the attack. Not keen on memorizing that? No need to worry: there will be coloured bars beneath each enemy indicating the order of the hits. Blue bars mean you click to the left, and red bars mean a click to the right, with the order of the bars going from top to bottom. What's surprising is just how satisfying it is to mow down your enemies. This is because of both how simple the gameplay is, and also how simple the art design is (again, both you and the enemies are merely stick figures). But punching through hordes of coloured stick people does feel satisfying, with each hit you land providing a satisfying crunch (Grandpa used to say this about his time in the South, during the olden days). The occasional gory death shot that randomly occurs is a nice touch, as well. As you plow through your stick-figured foes, sometimes they'll drop weapons that you can use to aid you in your fight. Melee weapons like swords and maces extend your range of attack, but can only be used for a limited amount of time. Ranged weapons like arrows, daggers, and bombs can be thrown across the screen to kill any enemy in a single hit, regardless of their health. You'll only get one ranged weapon at a time, though (unless you're using a skill that causes you to pick up 3 at a time, but we'll talk more about skills in a bit). As you progress through the game, you'll encounter different types of stages. The bulk of your gameplay will be done in melee stages, which are just a simple assault of different enemies. You'll also have special weapon rounds, in which you wield either a light sword or nunchucks, as you're assaulted by a quick barrage of single-hit enemies. Speed rounds impose a time limit upon you, requiring you to be swift in your punching. Multi rounds will have you play the same short wave of enemies multiple times in a row, with an increase in speed each time. Survival rounds test how many enemies you can defeat before you are killed (and always reward you with a victory, regardless of how well you do). There are other types of levels, as well. Levels are selected from a map screen, which is frankly horrid. It's not that I have an issue with map screens, but this one is simply god-awful. It's ugly to look at and does not allow you to scroll, instead forcing you to navigate by clicking on levels, which is overly cumbersome when trying to go to a level that's 2 screens away. The map features branching paths for the levels, but there's little rhyme or reason to the different paths; they're just levels thrown on each path that are gradually increasing in difficulty, rendering the map largely pointless, save from an excursion down a side path that leads to a dead end containing a skill. Speaking of skills, let's talk about those now. As you play through the game, you'll be able to procure various skills from certain levels as a reward for their completion. Skills may be equipped at the level select screen, and you may use up to 3 at a time. Skills become active after a certain number of kills (some as low as 1, some as high as 99), and will activate automatically. Skills range from allowing you to pick up 3 ranged weapons instead of 1, to healing a single hit point, temporarily extending your attack range, freezing enemies, and more. How long it takes you to complete level mode will largely depend on how many levels you retry to get a perfect on, and how much time you spend doing so. If you just try to beat all the levels, you can likely complete the game in about 6 hours. I spent a lot of time redoing many levels for the perfect (managing to get a perfect and a platinum medal on over 100 levels), and it took me around 12-14 hours to complete. That pretty much covers level mode, so let's talk about survival mode. First of all, it's important to note that survival mode is much different than the survival rounds you'll encounter in level mode. For that matter, it's also much better than level mode's survival rounds. Before you begin an attempt at survival mode, you may select the skills you wish to use, and then you are thrown into combat. As you go along, enemy speed and difficulty will gradually increase. Every so often, you'll be thrown into a weapon round, alternating between light sword and nunchucks. Weapon rounds are triggered by doing well in the main part of survival mode (so basically not missing and not being hit), and in addition to allowing you to quickly rack up extra kills, they also allow you to regain HP by killing a special enemy that charges at you every so often. Weapon rounds end after you are hit 4 times, and the hits you take during a weapon round do not detract from your HP. Now, let's talk criticisms before we go. I mentioned two already: the horrid map design, and the lack of an option to remap keys. Aside from that, the game's menus and interface are clunky and more difficult to use than they should be. When you first launch the game, it gives you the option to make the window size bigger or smaller, or to make it full screen, but you're not able to adjust this once you make your choice without closing and relaunching the game. Thankfully, none of these criticisms detract much from the game. When all is said and done though, OFDP is well worth a go, as stick figure combat is apparently highly entertaining. Plus, it's only a couple bucks on Steam, so why not give it a shot?